David Condry is Musical Director of Kingston Orpheus Choir. A professional choral director of several years’ experience, David has been conducting choirs since his student days at Leeds University. David’s first appointment as a conductor came at the age of 22 with Morley Music Society in West Yorkshire. 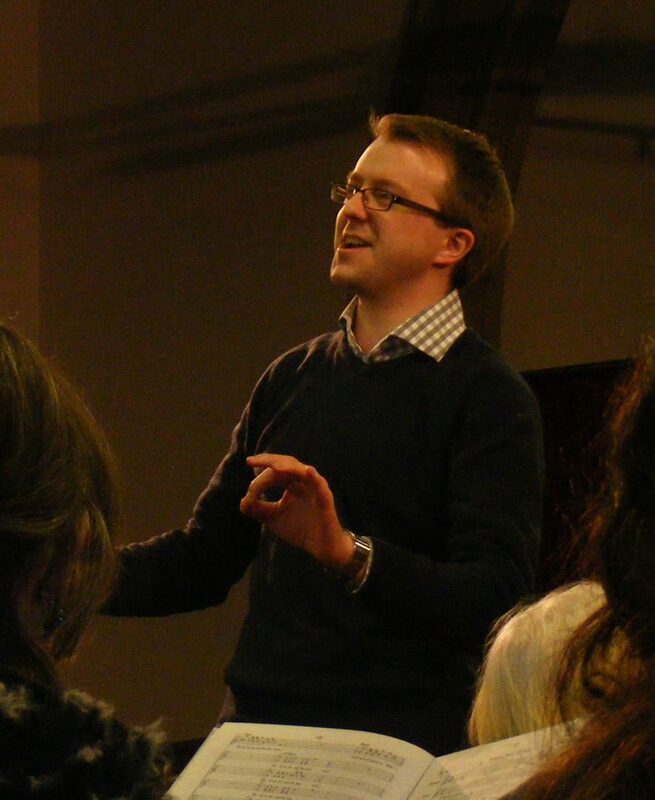 David founded the Leeds based semi-professional chamber choir Ecclesia, in 2007 and continued to direct this critically acclaimed choir until handing over the reins last year to Daniel Justin, Organist of Leeds Cathedral. David has always been keen to encourage young musicians; whilst in Yorkshire, David was Director of Choral Music at Hipperholme Grammar School in Halifax where he founded the Boy’s choir. David continues to work with young musicians and has recently been working with the choir at the Yehudi Menuhin School in Stoke d’Abernon. From 2009 to 2011, David was Assistant Director of Music at Bradford Cathedral and in this role directed the cathedral choirs and played the organ for cathedral services, CD recordings, BBC radio broadcasts and foreign tours, conducting the cathedral choir to packed audiences in northern Spain. David has studied orchestral conducting and choral direction with a number of tutors, most recently Paul Spicer. As an organist, David continues to play, mostly as an accompanist; he is a deputy organist at Guildford Cathedral and has accompanied for Tenebrae. David is also active as a professional singer having begun singing at an early age as a chorister in London. Singing in professional church choirs has been a constant feature of David’s career having sung as a full time singer with Leeds Parish Church Choir and York Minster Choir and as a regular deputy with Ripon; Wakefield and Manchester cathedrals; and in London, the choirs of Westminster Abbey; Westminster Cathedral; the London Oratory; St George’s Chapel, Windsor Castle; St Bartholomew-the-Great, Smithfield; St Brides, Fleet Street; St Mary’s, Bourne Street; and Guildford and Winchester Cathedrals. David has sung with many of these choirs variously in live radio and television broadcasts and commercial CD recordings. David has performed roles in operas, given song recitals (including a premiere of a song cycle at Opera North in Leeds) and sung as a soloist for many prestigious choirs. David also sings with a number of professional ensembles including the internationally renowned choir Tenebrae and the Delphian Singers, and has worked with some of the world’s finest conductors, including Trevor Pinnock, Nigel Short and Stephen Layton. David has performed internationally as a singer, most notably in the Gewandhaus in Leipzig, several venues in Rome, Florence and Siena, the Netherlands and recently New York and Boston. Recent solo works have included Bach’s Christmas Oratorio, Handel’s Messiah and Dvorak’s Stabat Mater.